The HEALTHIEST Bread in the World - NO FLOUR! 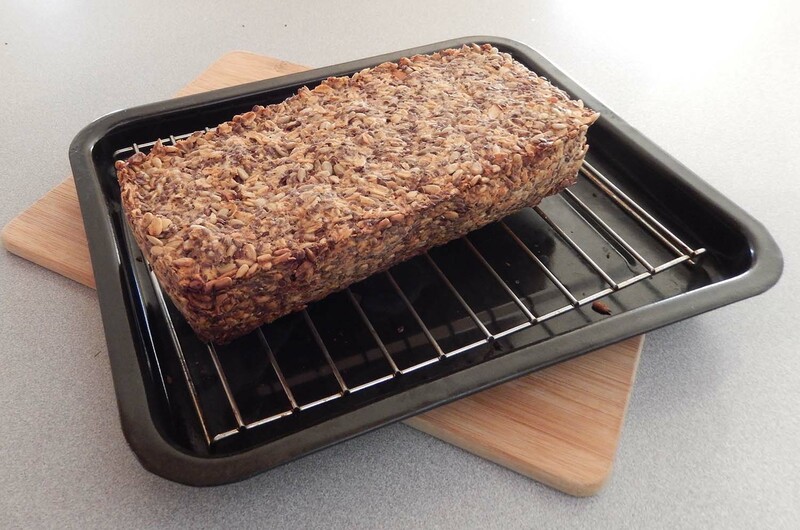 This bread recipe has NOTHING to do with aquaponics, but many of our readers are full-fledged ‘foodies’ (as we are) and we enjoy passing along recipes that light us up. THIS ONE IS A GOODIE. You must try it. The Danes make the best breads in the world and I’m passing along a much-loved recipe of theirs that is so good for us that we make it regularly. WE LOVE IT and it’s high in fiber and protein. It’s also gluten-free and vegan and digests easily (pre-soaked ingredients). Crumble up a small slice and use as a morning cereal. Add blueberries, bananas or fresh peaches for a royal treat. Colle makes fresh almond milk for cereal twice a week by adding a dozen unsalted almonds, a few walnuts and 2 tablespoons of unsweetened coconut, a cup of ice and about 10 cups of water into our Vita-Mix. Blend to mix and serve over cereal. It is delicious! Toss a few tablespoons of this great bread into yogurt for a taste treat. Crumble up a small slice and throw over a fresh lettuce, vegetable or fruit salad for a crunchy surprise. Throw a few tablespoons into a protein drink for added flavor and texture. I mix all the dry ingredients in great batch quantities to last for a month so I can make this recipe quickly without have to get out all the ingredients every time I make a loaf. Then, when I want to make it, I just measure out the 2 2/3 cups of the dry ingredients then just mix in the liquid ingredients to let it sit (minimum 3 hours) prior to baking. Since the bread lasts five days (when wrapped tightly in aluminum foil or wax or freezer paper and secured well with 2 rubber bands), I make four or five loaves per month to have on hand around our busy house to serve guests as a special yet healthy treat. First, whisk maple syrup (or agave nectar), oil and water together in a separate bowl. Then MIX ALL THE DRY INGREDIENTS WELL and then add the liquid mixture to the dry ingredients and combine until everything is completely soaked and dough becomes very thick, adding 1-2 teaspoons water if dough is too thick to stir. Pour the mixture into a baking pan and then pound down the mixture so there are no air pockets anywhere in the mixture. Slap it with your hands or with a wooden spoon. Smooth the top and then let sit at room temperature IN THE BAKING PAN for at least 3 hours or overnight before cooking. Instead of a typical metal baking pan, I use a silicone baking pan (it is flexible and is great for baking) and the bread just pops out perfectly (image above). Bake bread for 20 minutes, then remove bread from loaf pan, place the loaf upside down directly on a rack, and bake for another 40 minutes (it should sound hollow when tapped). Let cool completely before slicing. Store in an airtight wrapping or container for up to 5 days. I can’t wait to try this. I have just started drinking Almond milk and it will be great to make it myself. 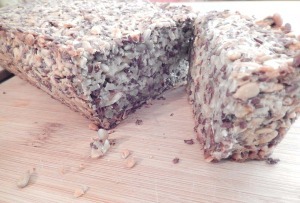 Also the bread looks exciting to use as granola. Thanks for the wonderful recipes. Thank you Gary. THEY ARE DELICIOUS.